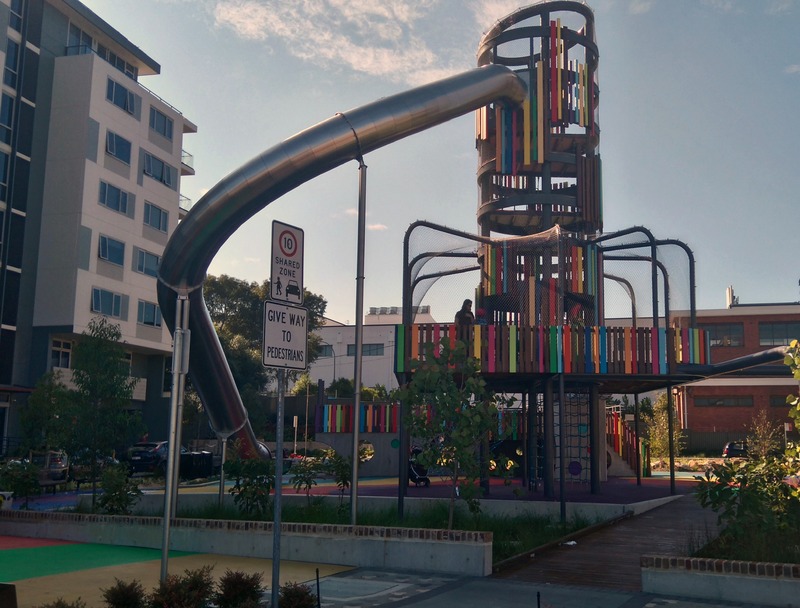 The daredevil kids of Sydney have a new playground to explore! Wulaba Park in inner city Waterloo is so cool that I'm sure kids from all over Sydney will want to visit, as it has one awesome and very tall slide, that will have little thrill seekers screaming for joy. Wulaba Park is situated amongst towering apartment blocks in the newly generated area of Waterloo (ostensibly it has been built for the residents of these blocks as their "outdoor" area). It actually provides more than 4,000 square metres of space for everyone to enjoy. The rainbow coloured playground is dominated by the towering slippery slide. You have to climb up a series of equipment to get to the top of the slide and the space is covered in wire mesh to avoid any falls. And if any little tumbles or falls do occur whilst at the playground, their impact will be lessened considerably by the soft fall surface that covers so much of the area. For those kids who are daunted by the height of the slide, there are also swings, climbing nets and tunnels to be climbed through. There are even handball courts and two ping pong tables to be played on (but you will need to bring your own balls and bats). If you have a footy or a kite there is plenty of green space to kick and fly them, or just to run around wild like all kids love to do. The playground equipment has been thoughtfully designed, understanding the need of parents having to climb up with younger or frightened children. It is always a tad embarrassing as a parent when you have to climb up into playground equipment to retrieve a child struck down with fear, only to get stuck in said equipment yourself, because your behind may not be as small as it once was! Wulaba Park is also a great spot to have a picnic, as there are 4 BBQs and self cleaning toilet facilities on site, as well as loads of space to throw down a picnic rug. You will also find quite a few park benches for parents to wait patiently on, whilst their kids slide and climb over all of the cool apparatus, over and over again. Wulaba Park is an absolutely fantastic playground but it is concerning that it is not fenced. There are lane-ways all the way around the playground that cars use to access the apartment buildings, as well as car spots located right next to the playground area. And even though the speed limit is 10km/hr and pedestrians have the right away, you will most definitely need to keep an eye on wandering children. It will also be interesting to see how hot that big metal slide gets on a stinking hot summer's day in Sydney. So where exactly is this awesome playground? Unless you are a local, you may have difficulty finding Wulaba Park. It's hidden down at the end of Amelia Street in Waterloo, near Mystic Lane. There is limited parking next to the park, so I suggest you park in the East Village shopping centre which is about a 5 minute walk away on the corner of Gadigal and Defries Avenues. They offer free parking for 2 hours. When you are walking to Wulaba Park, make sure you grab a coffee and sweet treat from the brand new Treetop Cafe (cnr O'Dea Ave & Hatbox Pl). They make a pretty good brew of Di Bella coffee and as your kids will want to spend quite a bit of time in the playground, I suggest you buy a large size to keep you going. Why? To slide down that awesome slippery slide! Looks like a great space Little Munch. Were you brave enough to have a go on the slide yourself?